“What’s your favorite Burger” is the top question people ask me. It makes sense. I like Burgers. People have a sense of trust in my opinion. They want to know where I would go to get one. I am humbled to be asked this question. However, the reality is that I like a whole ton of different Burgers. Picking just one is difficult. More often than not I choose where I’m going to eat a Burger based on how I feel at that moment. So maybe I want an old school slider or I’m looking for something chef driven and fancy or I want to old school Irish pub-style Burger. The point is; I feel crippled in having to give somebody just one answer. Mostly because I believe in equal opportunity Burger eating. However, if you’re going to nail me down to a subset of 1 or just a couple answers without giving me qualifications based on the type of Burger you like or the neighborhood you’re asking about, I do have some standards. One of the BEST Burgers in NYC is the Spicy Smokehouse Burger from Genuine Roadside. It’s topped with Spicy Smokehouse Burger bacon, smoked gouda, charred jalapeño mayo, sweet pickles & chipotle bbq. While I would normally opt for something more traditional, like cheese and grilled onions, I will always deviate from that answer when I believe a restaurant understands how to do something unique better than anybody else. This Burger from @eatgenuine is the shining example of how this restaurant knows what’s good in Burger innovation. 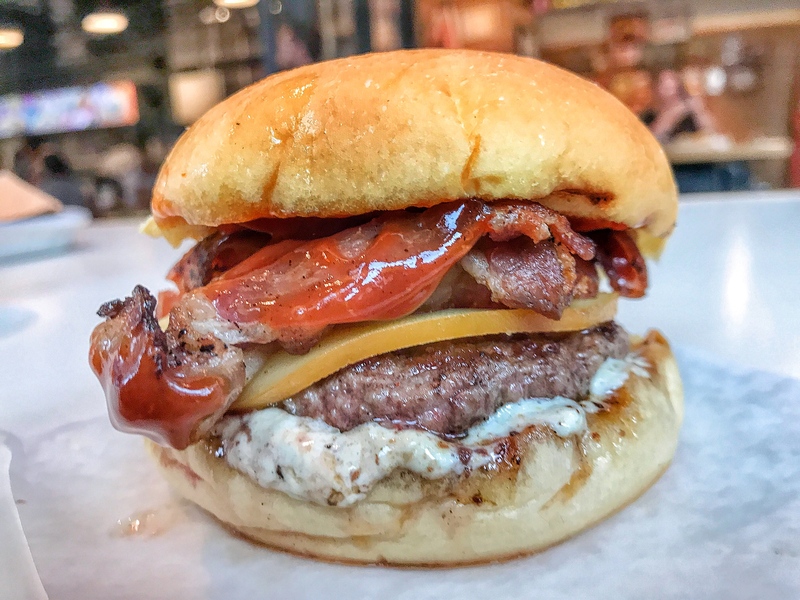 This entry was posted in Best Burger in New York, Burgers, New York and tagged best burger nyc, Genuine Roadside, gotham west market. Bookmark the permalink.